Our Manually Operated Pass Thru Windows are unsurpassed in durability and performance. Each Drive Through Window has been designed with simplicity in mind. Shipped Fully Assembled and Ready to Install. Warranty backed by nationwide service centers. Locking bar and slide-bolt locks. This window is made for businesses that have much smaller work areas to contend with and allow the business versatility of not having to cut a larger hole to use a standard 48” wide window. 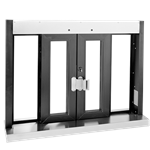 Model Q-BPSC-4836 Pass-Thru Window -- Manual, Bi-Parting Doors -- Flush Mount -- Stock Item! Model CM-1 is mounted flush to the exterior wall and is operated manually. 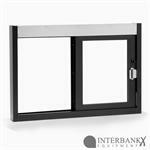 This unit provides a large service opening and both doors operate simultaneously when opening.